Dru Anderson and her werewulf friend Graves have found themselves at the Schola, a special school for djamphir and weres, protected from the nosferatu in this sequel to Strange Angels. Christophe promised Dru that she would be safe there, but Dru is beginning to discover that that sentiment is far from the truth. There is a traitor in their midst, one who is continually betraying Dru's location. Then when she learns the truth about Christophe's past, Dru must trust her instincts and decide her next move--because despite what everyone has been telling her, the Schola might not be the best place for her. 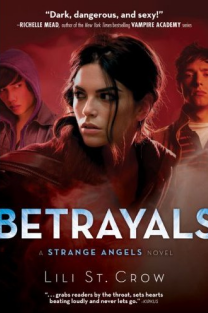 Like in the previous novel, Strange Angels, there is plenty of action and danger in Betrayals that will please fans. Most of the story takes place at the Schola, where St. Crow steadily builds up suspense, playing off of Dru's frustration at the lack of training and information she is receiving, her conflicting memories and feelings about her past, and her feelings of alienation and loneliness as the only girl in a school where Graves is becoming popular and strong. Sporadic visits with Christophe and Dru's solidarity with Graves add some romantic tension in the mix as well, leaving Dru even more confused, but through them, both Christophe and Graves grow as characters. But despite her numerous troubles and the odd and terrifying events throughout Betrayals, Dru remains stubborn and strong and continues to be a heroine readers can admire. St. Crow (whose action scenes have improved since Strange Angels) will answer a few questions in this quick-moving sequel, and ask a few more, adding some political intrigue on top of the supernatural mysteries at work. Readers, once finished, will eagerly look for the third book in this series, Jealousy. Cover Comments: I like the red in this cover, and how the model on the front looks very similar to the one on the Strange Angels cover (I'm not certain, but they might be the same girl). I also like Christophe and Graves in the background. Once again, I am a big fan of the title font, and how it is slightly cut off at the edges. It's very nice and unique! Great review. I have the first book on my shelf which I really ought to read at some point! I loved this one! Now I'm dying for Jealously.